Samples were taken from 100 camel sausages from the different retail markets in Aydin province in the south-west of Turkey and they were tested for the presence of Listeria spp by biochemical methods. Samples were enriched using Listeria Enrichment Broth and they were inoculated onto Listeria Selective Agar. Listeria monocytogenes was isolated from nine samples (9%), Listeria innocua from 14 samples (14%) and Listeria welshimeri from two samples(2%). A 701 bp fragment of listeriolysin O sequence for L. monocytogenes was amplified using specific primers by polymerase chain reaction (PCR) for confirmation of the identification. A random primer (OPA-11) was used in a random amplified polymorphic DNA (RAPD) assay. This detected five different band profiles amongst the L. monocytogenes isolates, indicating a relatively large amount of genetic heterogeneity amongst the nine isolates. The study has highlighted the need for improved strategies for food safety, in particular appropriate hygienic precautions to avoid contamination of sausage during the manufacturing process and appropriate preservation techniques during storage and transport, to prevent transmission of Listeria spp to consumers at home and abroad. A wide variety of meats and meat products, including fermented sausages, can be contaminated with Listeria spp . L. monocytogenes is known to survive the commercial dry sausage manufacturing process . In Turkey, Ciftcioglu  found Listeria spp in 11% of sausages, with L. monocytogenes in 2% and L. innocua in 8%. A subsequent study by Guven and Patir  found Listeria spp in 16.3% of sausages, with L. monocytogenes in 11.9% and L. innocua in 11.3%. Several molecular genotyping methods have been used to type L. monocytogenes, such as DNA restriction endonuclease analysis , multilocus enzyme electrophoresis , ribotyping  and pulsedfield gel electrophoresis (PFGE) . However, these methods are not well suited for routine use in laboratories and are time-consuming. PFGE is very discriminative, but it is labour-intensive and requires expensive apparatus . RAPD typing is suitable for differentiation of the most commonly found serotypes and for screening large panels of strains . The aims of this study were to determine the prevalence of Listeria spp in camel sausages at different retail markets in Aydin provience in the south-west of Turkey, to analyse genetic variability among L. monocytogenes isolates by RAPD using a random primer and to enquire whether there is a public health risk of acquiring listeriosis from consumption of camel sausage. Samples were taken from 100 camel sausages obtained from the different retail markets in Aydin province, in the south-west of Turkey. For microbiological analysis, the sausage casing was removed aseptically. A 25 g sample from each sausage was added to 225 ml of Listeria Enrichment Broth (LEB, Oxoid) and homogenised in a stomacher (Interscience, 78860 St Nom-France) at high speed, for one minute at room temperature and incubated at 37°C for 24 hours (primary enrichment). Then, an aliquot of 0.1 ml of the culture was transferred into tubes containing 10 ml LEB. The tubes were incubated for 24 hours to 48 hours at 37°C (secondary enrichment). A loopful of each enrichment culture was streaked onto Listeria Selective Agar (LSA, Oxoid) and was incubated for 24 hours, at 37°C. The suspected colonies with a dark brown colour or black halo were transferred onto tryptic soy agar (TSA, Difco) and incubated for 24 hours, at 37°C. The isolates were identified using conventional methods: Gram staining; the Christie, Atkins, Munch-Petersen (CAMP) test; typical umbrella motility; and fermentation of mannitol, rhamnose and xylose . A few colonies from cultures were transferred into an Eppendorf tube containing 300 μl of distilled water and the tubes were vortexed. Lysis was accomplished by the addition of 300 μl of TNES buffer (20 mM Tris-HCl pH 8.0, 150 mM NaCl, 10 mM EDTA, 0.2% SDS) and 200 μg/ml Proteinase K. The lysis mixture was incubated at 37°C for two hours and boiled for 30 minutes. Bacterial DNA was extracted by the phenol:chloroform:isoamylalcohol procedure. All purifications and PCR reactions used L. monocytogenes serovar 1/2a: CIP 104794/ATCC-35152 (obtained from Pasteur Institute) as the positive control and distilled water as the negative control. Primers used in this study were designed by Border et al. . The sequences of primer pairs were as follows: LM1 (5'- CCT AAG ACG CCA ATC GAA - 3') and LM2 (5'- AAG CGC TTG CAA CTG CTC - 3'). These primers amplify a 701 bp fragment on listeriolysin O sequence of L. monocytogenes. PCR reactions were performed in a reaction mixture (50 μl final volume) containing 5 μl of 10 × PCR buffer (10 mM Tris-HCl, pH 9.0, 50 mM KCl, 0.1% Triton X-100), 5 μl of 25 mM MgCl2, 250 μM of each deoxynucleoside triphosphate, 2 U of Taq DNA polymerase (Fermentas, Lithuania), 50 pmol of each primer and 5 μl of template sample DNA. Amplification was obtained with an initial denaturation step at 94°C for five minutes, followed by 45 cycles at 94°C for 30 seconds, 52°C for one minute and 72°C for one and a half minutes. The final cycle was at 72°C for seven minutes. For all experiments, a Touchdown Thermocycler (Hybaid, Middlesex, England) was used. Ten μl of amplified products were detected by electrophoresis in 1.5% agarose, in 1 × Tris-borate-EDTA buffer. Gels were stained with ethidium bromide (0.5 μg/ml). The DNA fragments were visualised by UV illumination and photographed with Polaroid film. The molecular sizes of the PCR products were compared with a 100 bp DNA ladder. The RAPD reaction mixture was prepared in a total volume of 25 μl consisting of 2.5 μl of 10 × PCR buffer (750 mM Tris-HCl, 200 mM [NH4]2SO4, 0.1% Tween 20, pH 8.8), 3.5 mM MgCl2, 200 μM of each deoxynucleoside triphosphates, 1.25 U of Taq DNA polymerase (Fermentas, Lithuania), 1 μM of OPA-11 primer (5'-CA AT CG CC GT-3'), 11 μl of dsH2O (sterile distilled water) and 2.5 μl of template DNA. Each sample was amplified through 50 cycles of denaturation (one minute at 94°C), primer annealing (one minute at 37°C) and extension (one minute at 72°C). A last cycle of extension was applied at 72°C for 10 minutes. Twenty microlitres of product was resolved by electrophoresis on a 2% agarose gel in Tris-borate EDTA buffer and visualised by staining with 0.5 μg/ml ethidium bromide for 30 minutes. The agarose gels were photographed under UV light. A 1 kb DNA ladder (Promega, Maddison, USA) was used as a molecular size standard. RAPD assays were performed at least three times each to check reproducibility. Of the 100 camel sausage samples, nine (9%) contained L. monocytogenes, 14 (14%) contained L. innocua and 2 (2%) contained L. welshimeri. A 701 bp fragment was amplified from all the tested L. monocytogenes strains identified by conventional procedures (Figure 1), but not from the negative control. An agarose gel stained with ethidium bromide, with PCR products of L. monocytogenes isolates from sausages (M: 100 bp DNA ladder, P: positive control, N: negative control, lanes 1-9: L. monocytogenes isolates). 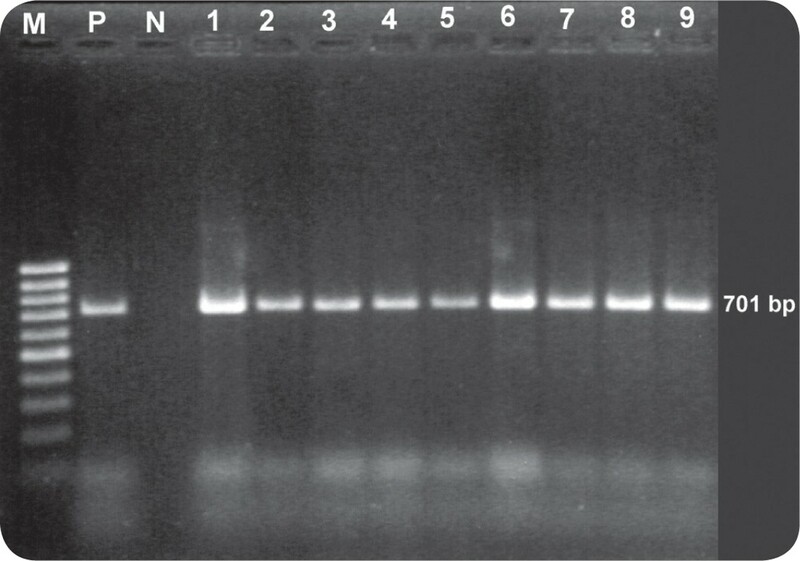 RAPD typing using OPA-11 primer detected five different band profiles (a, b, c, d, e) on nine isolates of L. monocytogenes (Figure 2). 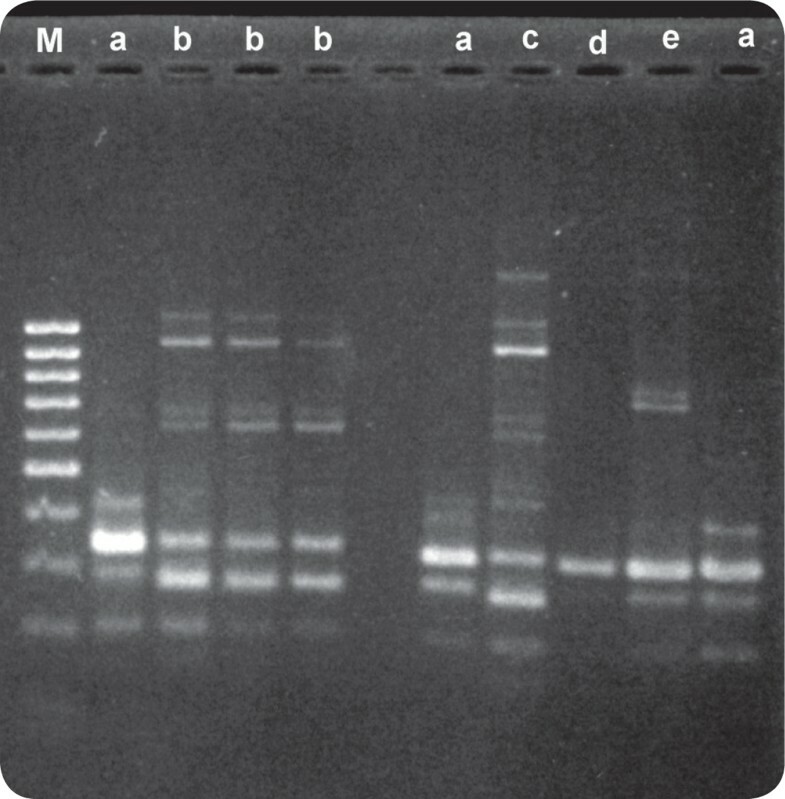 RAPD analysis of L. monocytogenes isolates from sausages (M: 100 bp DNA ladder, lanes a, b, c, d, e: profiles). Studies carried out in different parts of Turkey have found Listeria spp in 11%  to 16.3%  of sausages. In some other countries prevalence has been reported to be considerably higher [5, 9]. In the present study, Listeria spp were obtained from 25% of the sampled sausages. In this and in other studies, three Listeria species have been identified: L. innocua, L. monocytogenes and L. welshimeri [6, 15, 11, 14, 17]. In the present study, all the isolates of L. monocytogenes were successfully typed by the RAPD method using only OPA-11 primer. One random primer was used and five different profiles were observed, thus indicating a large amount of genetic heterogeneity amongst the nine isolates of L. monocytogenes. Overall, L. innocua has been isolated from sausage more frequently than have the other two species. For instance, Paziak-Domanska et al. recovered Listeria from 15 samples of sausage, L. innocua from 10 samples, L. monocytogenes from three samples and L. welshimeri from two samples. A similar trend was evident in the present study: L. innocua from 14 samples, L. monocytogenes from nine samples and L. welshimeri from two samples. In summary, this study revealed the presence of Listeria spp in a significant proportion (25%) of samples of camel sausage on sale in different retail markets in Aydin province in the south-west of Turkey. It has indicated that a large amount of genetic heterogeneity exists among L. monocytogenes isolates from camel sausage. Thus, it has highlighted the need for improved strategies for food safety, in particular appropriate hygienic precautions to avoid contamination during the manufacturing process and appropriate preservation techniques during storage and transport to prevent transmission of Listeria spp to consumers at home and abroad.